Pack a baby carrier for your walks. Sissinghurst Castle Gardens do not allow strollers, in order to protect their grounds. We used our baby carrier for our little one, but they also supply carriers if you don’t have one. Feel free to bring your stroller when exploring Bodiam Castle though! Bodiam Castle is stroller accessible. Sissinghurst Castle Gardens is incredible in spring, as all the flowers are blooming magnificently. In summer, the White Garden is supposed to be very beautiful, too. 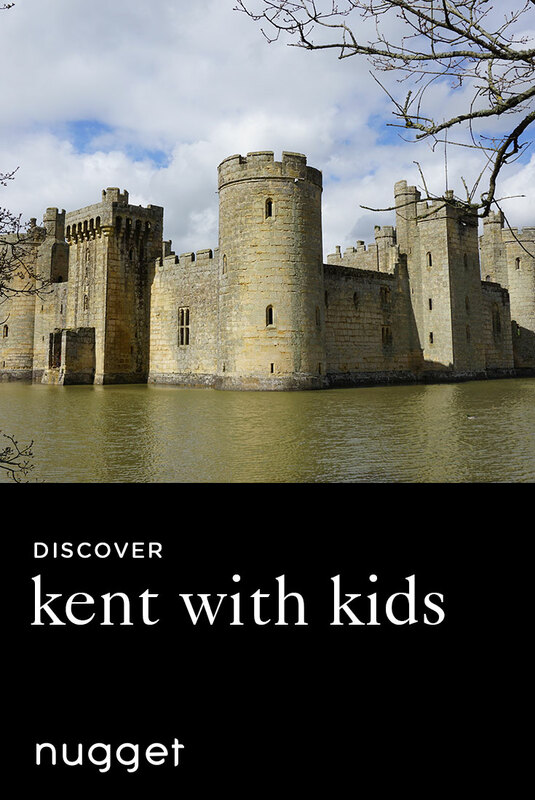 Discover medieval history and relive your childhood imaginings of knights and princesses at Bodiam Castle. Follow up your morning of fairytale adventures with a delicious and satisfying lunch at The Milk House, a modern pub in a quaint English village. Then finish off your day with a relaxing stroll through the Sissinghurst Castle Gardens. This mini-adventure is perfect for history lovers, young and old, and provides plenty of chances to explore and roam. Bodiam Castle is like a castle out of a fairy tale. It is perfectly symmetrical and is surrounded by a real moat. It is easy to imagine dashing knights, golden-haired princesses and dragons flying overhead. It was built in the 14th century, making it an enchanting example of a ruined medieval castle and a great way to indulge your childhood imagination. Our daughter loved running around the ruins in search of dragons. There are also birds of prey on display, which our kids enjoyed. Make sure to ascend one of the towers to get a stunning view of the surrounding countryside. TIP If you don't feel like eating out, Bodiam Castle is a stunning place for a picnic. I would definitely recommend packing a picnic and eating lunch here. There are picnic tables and plenty of open space for kids to run around and roam right next to the castle. Alternatively, you could eat at the castle’s Tea Room. The Milk House is a really lovely pub in the quaint village of Sissinghurst. It sources most ingredients locally, and the meals are delicious. The decor is fresh, and the pub has a friendly atmosphere. It also has a great selection with reasonable prices. Be sure to try one of the puddings - the warm brownie flavour is amazing! DIRECTIONS The Milk House in Sissinghurst is a 20-minute drive from Bodiam Castle. Sissinghurst Castle is more a large manor house than a castle, and its main attraction is the gardens. The gardens were transformed in the 1930s by Vita Sackville-West and Harold Nicolson, and every inch of the gardens is a testament to their careful planning and eye for natural beauty. The gardens are beautifully blooming. It has many paths and trails for kids (and adults) to run around and explore, while the overall site is not big enough to lose them. Our energetic nugget had a great time staying just out of our reach, as well as discovering the many colours and textures surrounding her. There’s also a tea room here, if you would like to eat here instead. DIRECTIONS Sissinghurst Castle Gardens are only a couple of minutes drive from The Milk House and Sissinghurst Village. Head east. You'll see the signpost to the Gardens on your left, about half a mile down. TIP Be aware that there is an unfenced moat at the far side of the garden. If you are feeling adventurous, there are some really nice walks around the castle of varying lengths. They are signposted, or a member of staff will be happy to give directions.